Demodex Mites are microscopic creatures that inhabit the pores of the skin. You can't see them with the naked eye and they live harmlessly on most people. Yes, this made us cringe too! It has been found that Rosacea sufferers have a higher density of these mites on their skin than those without Rosacea, as seen in the study The Demodex Mite Population in Rosacea. It is believed this higher density of mites may lead to or worsen the condition. On the other hand, some people believe it isn't the actual number of mites, but rather the bacteria released when they die that causes Rosacea. Yucky, yes we know but all the more reason to get rid of them, right?! The study Mite-related bacterial antigens stimulate inflammatory cells in Rosacea found this bacteria has "the potential to stimulate an inflammatory response in patients with papulopustular Rosacea." Another interesting point to note is that Rosacea tends to flare up during heat and humidity, conditions in which these mites thrive. Some studies such as this one have found that tea tree oil may help kill off Demodex Mites. The problem though is that Tea Tree Oil is required to be at least 50% concentration. This can be irritating on the skin and may potentially burn the skin. Medication is often prescribed to Rosacea sufferers which helps stop the mites from spreading and moving around the skin. The anti-parasitic medication Invermectin is one example that is commonly used to treat worms in dogs and other animal parasites. While it is often effective, there are some side effects such as possible neurotoxity which damages the nervous tissue. Additionally, this medication is not suitable to use during pregnancy, breast feeding or for children under 5 (as advised by your doctor). 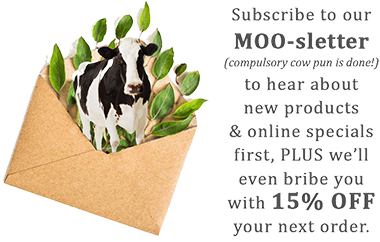 MooGoo has developed a powder for Rosacea caused by Demodex Mites. It will not necessarily help with other types of rosacea and as is often the case, what works for one doesn’t always work for another. For more information about our powder and how to use see here. Remember that Rosacea can be caused by Seborrheic Dermatitis (we have our Scalp Cream for this) or other causes. Olive leaf extract is taken in capsule form and acts in the same way that antibiotics do. It is very strong which means dosages must not be tampered with. There isn't a lot of research into this treatment unfortunately. The Omega-3 fatty acids found in Fish Oil have strong anti-inflammatory properties which help soothe the inflammation caused by Demodectic Rosacea. Vitamin E is effective in repairing damaged skin and helps reduce the redness caused by this condition. Whilst both of these may help soothe the symptoms of Demodectic Rosacea, neither of them do anything about the mite population on the skin which causes the condition to flare up in the first place. Abnormalities in the blood vessels of the face play a role in the development of Rosacea as it causes persistent redness and enlarged blood vessels. What causes the blood vessels to inflame and swell is unknown. It has been shown in the past that a relationship exists between gut problems and skin conditions, such as Rosacea. The following 3 Rosacea triggers are all related to a gut condition. Helicobacter Pylori (Hp) is a common bacterial infection that affects the lining of the stomach and causes inflammation and stomach ulcers. It affects over 30% of the world's population, according to the Centre for Digestive Diseases. Hp may also lead to an increase of Nitrous Oxide (NO) in the blood and tissue which, along with the inflammatory symptoms, is believed to cause a range of other conditions, including Rosacea. The bacteria may also prompt a protein known as bradykinnin to develop which may trigger the expansion of blood vessels (a common characteristic of Rosacea). The study The Link between Helicobacter Pylori Infection and Rosacea found, "Rosacea could be considered as one of the extragastric symptoms of Hp infection." Antibiotics are commonly prescribed for Hp infections. However, if antibiotics are taken too much, the bacteria may become resistant to their effects which force you to take higher or stronger dosages. L Glutamine is an amino acid that's found in high levels throughout the body. It acts as an anti-inflammatory and is essential for the proper fucntion of the immune system. It is often taken as a supplement to heal any damage and inflammation caused by Hp. This article goes into this a bit deeper and one study that examines the efectiveness of the amino acid in soothing inflammation is Why is L-Glutamine important to cells of the immune system in health, post injury, surgery and infection? Some cases of Rosacea are caused by Small Intestinal Bacterial Overgrowth (SIBO). SIBO develops when there is a growth of excess bacteria in the small intestine (in a healthy digestive system there is only a small amount of bacteria present). This causes inflammation and damage to the intestinal wall which prompts other conditions such as Rosacea to develop. The study Small intestinal bacterial overgrowth in Rosacea: clinical effectiveness of its eradication found that, "Rosacea patients have a significantly higher SIBO prevalence than controls." Antibiotics are often prescribed to treat SIBO and may be quite effective for some people. There are quite a few internet forums that look at the use of antibiotics such as this one. However, prolonged use of antibiotics may disrupt gut flora which is increasingly being linked to other health risks. When carbohydrates are eaten, they break down during digestion and 'feed' the bacteria. Of course we do not want that to happen! We recommend that if you have SIBO, avoid grains and rather stick to veggies, fruits, legumes and protein instead. Grapefruit extract, oregano oil capsules, garlic and olive leaf extract are some other herbal remedies however there isn't too much research into these. Digestive enzymes are often taken to help support the body's digestive system until the unwanted bacteria is removed. Probiotics are often taken by SIBO sufferers which help reduce the inflammation caused, inhibit unwanted bacteria and help the body's digestive functions work more efficiently. Leaky Gut Syndrome (LGS) is a common condition that occurs when the digestive tract walls become too penetrable, thus allowing toxins, allergens and food molecules to pass out of the gut into the rest of the body. The immune system identifies these as 'invaders' and responds to them as it normally would to say the Flu virus. As the leakages occur each meal, this leads to an overactive immune response which leads to inflammation and further conditions, such as Rosacea. Initial emphasis should be placed on healing the damaged digestive tract and soothing the inflammation caused. We recommend identifying any possible food allergies and make the required nutritional changes. Probiotics are often taken to help repair the intestinal tract and reduce the associated inflammation. Glutamine, an amino acid, helps restore the gut barrier and digestive functions that are impacted by this gut condition. This article looks into this a bit more and the study Glutamine: a role in gut protection in critical illness looks at the effectiveness of Glutamine in treating LGS.